The photos don't do this large, handsome door plate justice. Your guests will gasp at its elegance. 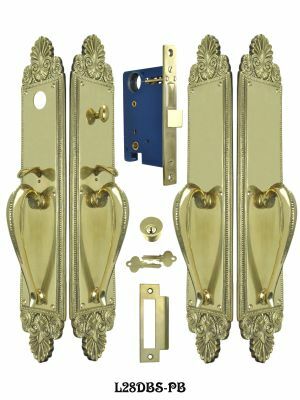 Exterior quality handle-only door plate. Enormously detailed, cast in the Lost Wax process to preserve the fine lines and beadwork. Scallop seashell design near top, also excellent for High Victorian Rococo style entryway. Choose from solid brass, left unlacquered to age gracefully over time; or our "antique" brass finish to blend with older existing hardware.